With west-facing windows and sliding glass doors in both the bedroom and the connected private bathroom, the large Master Suite opens directly onto its own furnished sitting terrace, the huge back garden and pool area, and breathtaking views of the San Jacinto Mountains. At night the iconic light of the Palm Springs Tram station lights up the highest peak. 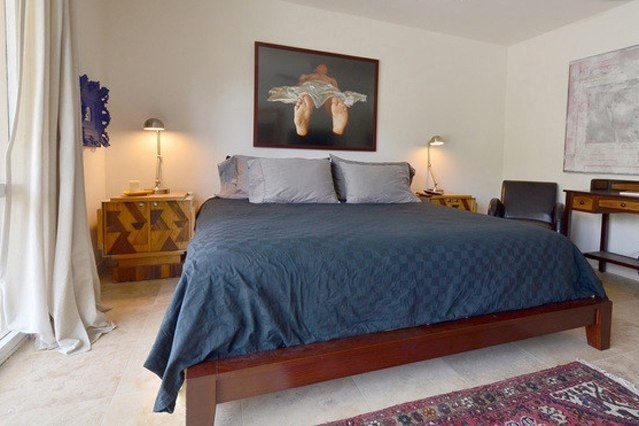 The room is furnished with an extra long king size bed, large nightstands, and a comfortable leather reading chair. In addition, a small desk and stool for computer work/letter-writing, a large flat screen premium cable television, and high speed wifi internet make the Master Suite a fully self-contained living/work space. As a point of interest, the bedside tables and long chest of drawers, as well as the armoire in the walk-in closet, were part of the bedroom furnishings of the late great Lena Horne. A huge walk-in closet that provides more than enough space for clothes, or even a full ironing board, lies just off the short corridor connecting the bedroom with its fully private ensuite bathroom. 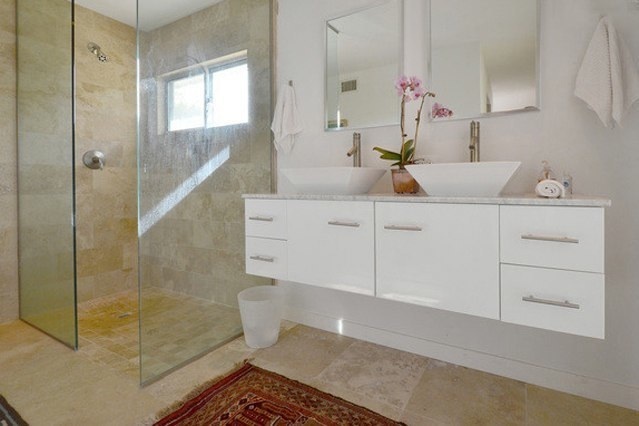 Recently re-modelled, the large contemporary bathroom has a floating double sink vanity and an oversized glass-walled walk-in shower, as well as the other requisite plumbing. It also has a full sliding glass door that opens directly into the backyard for easy access straight from pool to shower.